Looking at these statistics, I was thinking how can the connected home sector change this, to get connected home solutions and services to the masses and at the same time create compelling use cases to drive the adoption needed to accelerate the sector. One of the answers I can think of is, rather than trying so hard to convince and woo consumer to these fancy services and solutions, that the sector should instead spend more time and money collaborating with the housing sector. For years both the connected home sector and the housing sector work as separate entities only crossing paths when its necessary and the law requires they do so. They follow a separate method we build the home and you sell the solution to the homeowner. By then, I then I think it is too late. Most of the homes being built are for low to middle-income families and most of these families do not see having a connected solution as priority. The need to have their home connected is not high up on the agenda for more than one reason. First and foremost would be the cost, because it might be considered a luxury and the cost to renovate or rebuild just for smart home services might be too great to justify for many; the other would be they might not see any immediate need for it. We see many instances of housing developments around the globe where both sectors have worked to develop and sell homes with connected services and solutions already installed. We also see smart city projects but these are not consistent; there are more smaller housing development being done. We need to have more of these collaborations for small developments. The key areas now are entertainment, security and energy management with health services coming up behind. I am thinking, if developers can sell houses with heating and air conditioning, why can’t the connected home sector partner with these developers to add more services. Such as security, smart thermostat with other energy management tools, smart meter and smart lighting. With these services and solutions already installed, I think it will create a market for additional services and products. We would be teaching and showing the general public what connected solutions can do to create the convenience, time and money saving which they did thought of. Also, we would be educating a whole community about connected solutions and not just a few enthusiasts. The point is to make easier for everyone to have it. Connected home solution is about convenience and saving time and money so why not build homes with it already installed. The service partner could provide after sale support for the connected solutions as they would for the other appliances. When both sectors are working together many of the issues that homeowners come across would be eliminated - example the need to re-cable. 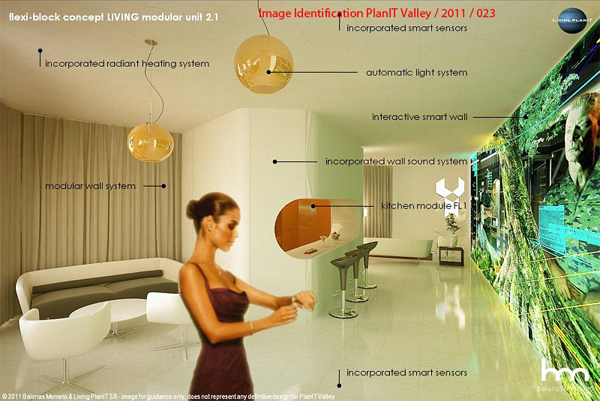 This would get the designing aspect more involve so we can develop homes for today and tomorrow’s connected life style. Within the connected home sector, there are partnerships and collaboration happening all the time, what the sector needs is partners that touch the consumer in a personal way. I see housing as one of those sectors, and the thing is both sectors would benefit from this. The developer would be selling a complete package, removing hassle of further sourcing and install these services and the connected home sector would be getting the mass adoption it really needs. “Moving the smart home industry from early adopters to mass market will depend on widely popular applications of the technology, rather than the technology itself”, said Jefferson Lyman, chief marketing officer at Vivint. The adoption of any technology follows certain pattern, where you have the early adaptors (a small minority) using technology. Then it moves on to the masses and then it becomes legacy with a few still using it. What I am proposing is a plan to take the connected home to the masses; this I think will accelerate its use. One of the issues I see with this is the need for seamless connectivity between different products when the homeowner needs to repair or upgrade their solution. They might want to choose a different brand from what they have installed. This is where the need for openness and standardisation are needed.